WASHINGTON (CNN) -- Pakistan should commit to increased fighting against the Taliban on the border area it shares with Afghanistan if it wants more defense funding from the United States, a key senator said Thursday. 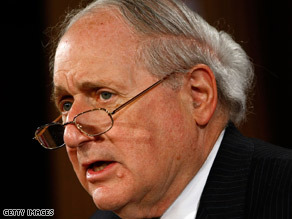 Sen. Carl Levin says Pakistan's leadership must dedicate itself to the fight against extremists. "A commitment on the part of Pakistan's leadership to take the fight against militant extremists in their territory is a prerequisite for success and effectiveness in our assistance to Pakistan in confronting the terrorist threat," Sen. Carl Levin of Michigan said at a hearing on the 2010 budget. Levin, a Democrat, is the chairman of the Senate Armed Services Committee. There is a request for $700 million in the budget to fund the development of counterinsurgency efforts in Pakistan. The United States also provides intelligence to Pakistan. Defense Secretary Robert Gates agreed that fighting Taliban extremists was important but added that Pakistan's recognition of the insurgent risk had intensified in the past weeks as the Taliban expanded control to the Buner region. Buner is 60 miles from the Pakistan capital of Islamabad. The United States recently flew an unmanned drone over Pakistan's mountainous border region with Afghanistan to demonstrate that it was feasible to get useful intelligence from the overhead flights to the Pakistanis. A "small number" of additional flyovers were requested to help Pakistan in its insurgent fight along the border, The New York Times reported Thursday. The Pakistani government has repeatedly requested to be provided with its own drones, which the U.S. has resisted. But the United States has offered to fly additional Predators over the region to gather intelligence on targets and then give the raw data to Pakistan, two U.S. military officials said. Pakistan has not asked for any more missions, the officials said. Requests for drone flyovers from the Pakistanis have ceased, said Adm. Michael Mullen, chairman of the Joint Chiefs of Staff. "They haven't asked for any additional assistance along those lines over about the last 30 days," Mullen told the Senate committee. In lending drone support, the Pakistanis would have no control over any future missions. The drones may be armed because they would be "on call" for mission, but no weapons would be dropped over Pakistan, the sources said.